Gullies,channels and other features on the martian surface have long suggested thatwater flowed across red planet long ago. But a growing number of observationsshow frozen water is there now. The findingsof NASA's PhoenixMars Lander, announced throughout the mission, are now detailed in a set offour papers in the July 3 issue of the journal Science. They are thefirst to describe the northernmost reaches of the red planet and shed light onthe history of water on Mars, as well as the planet's potential habitability. 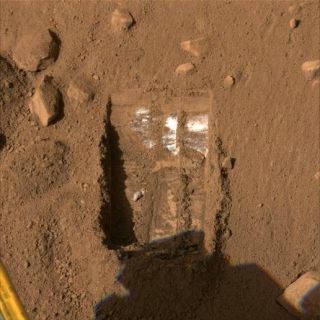 Among themost significant finding from Phoenix, which landed on the red planet May 25,2008: a layer of rock-hard water ice just a few inches beneath the surface ofthe dusty arctic plains. Phoenix unearthed other surprises: TheMartian dirt at Phoenix's landing site proved to be unexpectedly clumpy andcontained some compounds that set it apart from the sites where the lander'srover cousins have been investigating. Phoenix was sent to the Vastitas Borealisplains of Mars in part to confirm observations from NASA's Mars Odyssey orbiter(still circling the red planet) that showed signatures of water ice beneath thesurface of the region. Using itsrobotic arm, Phoenix dug into the Martian surface to see if it could reach theice below. In onetrench, dubbed "Dodo-Goldilocks," the lander exposed what missionscientists described as "bright material" about 4 to 5 centimetersbelow the surface (a similar patch was seen below the lander itself, likelyexposed by the spacecraft's landing thrusters). Over the next two months, theteam watched as Phoenix's cameras showed that the material was sublimatingaway, which would be expected of water ice exposed to the Martian atmosphere. Thetendency of soil samples scooped up by the lander to clump together made itdifficult to get the samples into Phoenix's onboard instruments, but afterseveral attempts, a sample was coaxed in and the lander's detectors confirmedthat there was indeed water ice hiding under the regolith. The confirmation wasoriginallyannounced on July 31. Interestingly,the ice seems to occur at different depths under the surface depending on theterrain. The plains where Phoenix landed feature polygonal mounds surrounded bytroughs that result from the seasonal expansion and contraction of the iceunderneath the surface, which creates cracks and crevices. The icebelow the center of the mounds was fairly shallow, "but in the troughs inbetween, we went down as much as eight inches and never did find the iceunderneath," said the mission's principal investigator Peter Smith, of the University of Arizona. Just howthe ice got there is still not known, though researchers have a few theories. "Itcould have been the remnant of a larger polar ice cap that shrank; could havebeen a frozen ocean; could have been a snowfall frozen into the ground,"Smith said. "The most likely theory is that water vapor from theatmosphere slowly diffused into the surface and froze at the level where thetemperature matches the frost point." Just asinteresting as the water ice itself are the chemical signs in the soil thatliquid water interacted with the soil in the past. Phoenix's instrument detected a range ofcompounds and elements in the soil, but two were of particular interest becausethey imply reaction of the dirt with water. Calciumcarbonate was detected by Phoenix's Thermal and Evolved-Gas Analyzer (TEGA),which heated up samples and then analyzed the gases coming off them. Conditionson early Mars were expected to be ideal for the formation of carbonates, butfew have been detected by orbiters or surface missions to the red planet. Thecalcium carbonate, which makes up only about 3 to 5 percent of the soil byweight at Phoenix's site, likely formed in the past when carbon dioxide in theatmosphere interacted with films of water on soil particles. Thecarbonate also acts as a buffer that gives the soil an alkaline pH (about 7.7),a marked contrast from the acidic soils seen in other Martian locations. Analkaline soil environment is also interesting because it is similar to that ofmany habitable environments, for example, Earth's oceans. The otherchemical standout was a compoundcalled perchlorate, a highly oxidizing substance. "Perchloratewas not predicted at this landing site and nobody had it on their list oflikely chemicals," Smith said. "There was a very high concentrationof it, higher than the salts we might have expected like sodium chlorate (tablesalts)." Perchlorateis an interesting find because it has "a strong affinity for water,"Smith said, adding: "On Earth, microbes use it as a chemical energysource." Thesefindings will help inform scientists' understanding of Mars' past and provideevidence of a place where any potential life could have thrived. "Whoknows? Evolution is a powerful force. If life ever started on Mars, there areniches where it could still survive," Smith said.